This weekend I went to the Red Sox Rolling Rally and it was awesome. 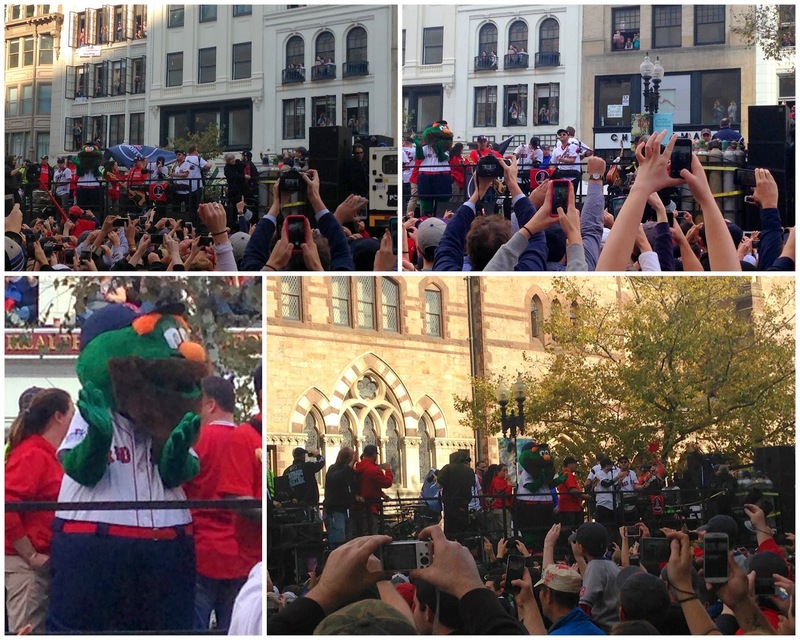 Not only was it in the 60s in Boston (which is crazy warm for Nov) but the vibe in the city was hot! I set my alarm for 7:30 AM and that is very early to get up on a weekend. Public transportation was packed but I finally made it to Copley Square a little after 9:00 AM. I was meeting Rachel and her husband there so I found a good spot and waited for them. I got a pretzel and I wish I could say that it tasted as good as it looks. It did not. It was actually pretty gross! The most fun thing to do while waiting for the parade to start was people watch. This guy went all out! 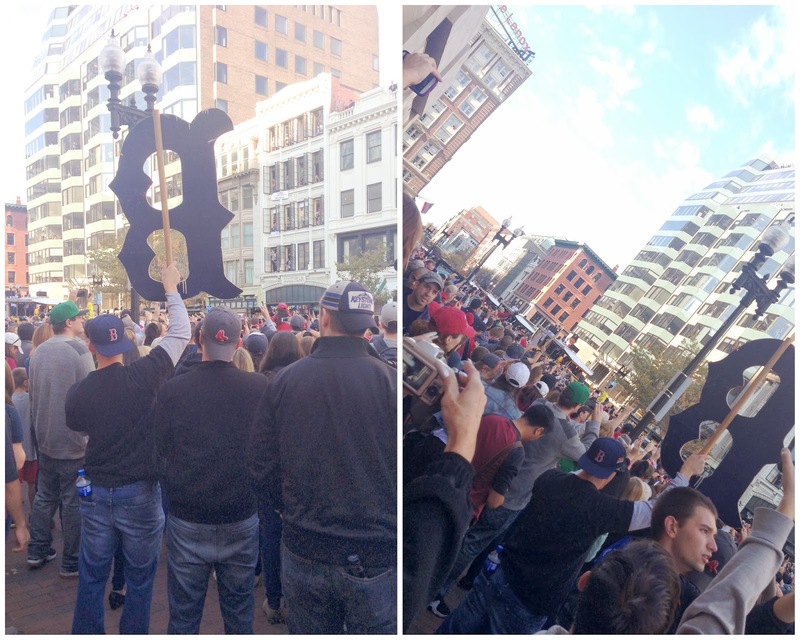 There were other "costumes" mostly consisting of beards, boas and Red Sox tattoos. Despite it being packed tight with people the crowd was in control! 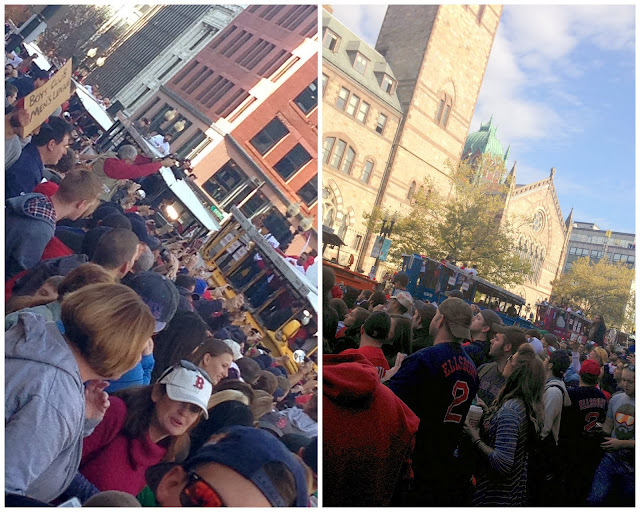 I wanted to be in Copley Square. 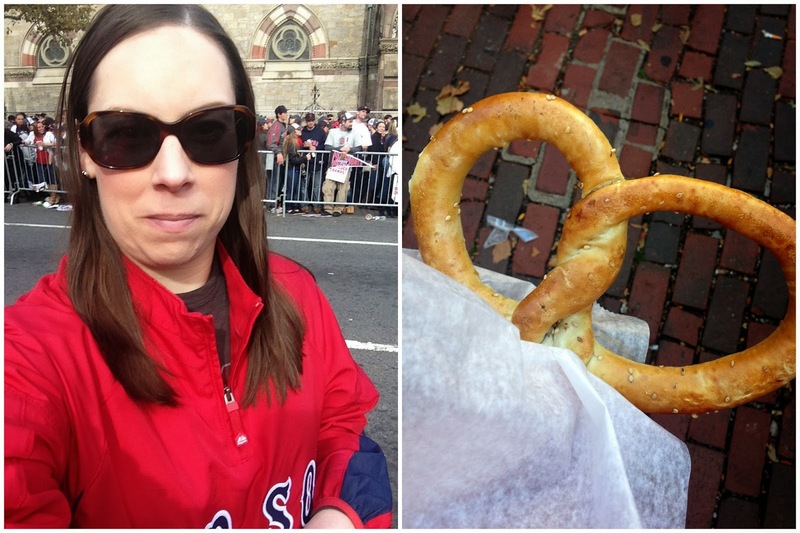 More specifically I wanted to be at the Boston Marathon finish line. I was so happy to see that so did thousands of other people too. There was a special ceremony at the finish line in honor of the Boston Marathon victims and the most special moment was when one of the duck boat drivers broke out singing "God Bless American" and the whole crowd started singing too. Talk about a tear jerker. Wow! How about the banner the Charlesmark Hotel made?! Too funny! Oh and can we talk about the view from these windows? How cool would it be too live or work in one of these buildings. . . There were 25 boats in the parade. Each boats had signs with the names of the people on it. 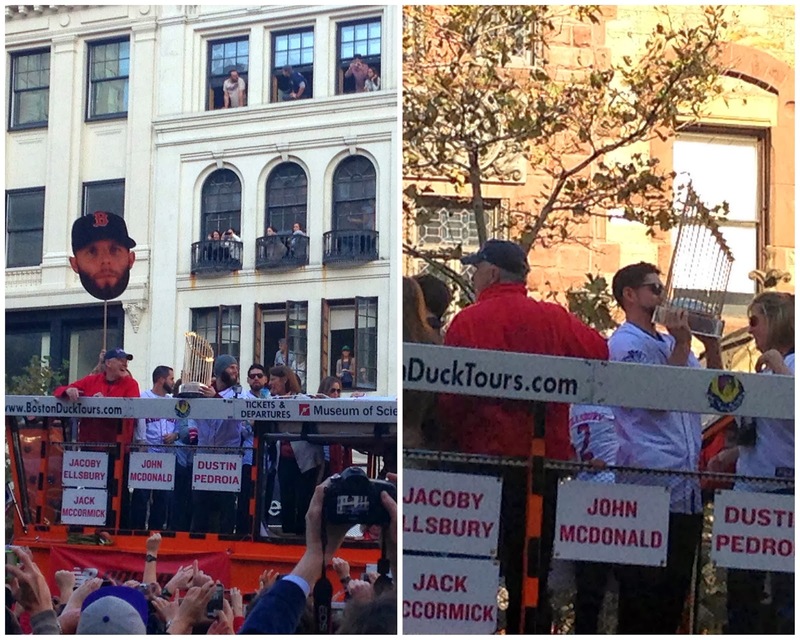 In addition to all of the Red Sox players there were boats with staff and family too. The people on the boats were taking pictures of us while we were taking pictures of them! Can you believe these crowds?!!!! SO many people. I read that there were no arrests and no injures which is pretty amazing when you consider how many people crammed into the city! After all the boats went by I took a picture of the finish line. There were A LOT of police on the parade route especially in this area. I think it was good. This spot now has a new happier memory associated with it. The Dropkick Murphys were in the parade and played the entire time. Wally was with them sporting a beard! 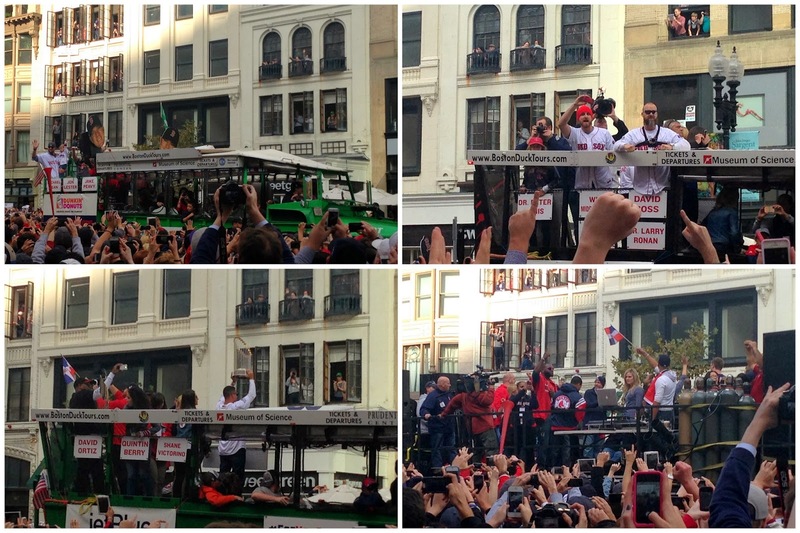 The players were close enough that when people yelled their names they actually would turn and look and wave. It was very cool! Loved seeing how much fun they were having. Jon Lester was holding his son when he went by us and it was very sweet! It really was the most gorgeous day. I was hot (since I had put on 3 layers)! After the parade went by we made our way toward the river so we could check the boats out there too. First we had to walk through the Public Gardens and the colors were AMAZING. I couldn't believe how pretty it looked this late in the season. We haven't had much rain this fall so a lot of the leaves are still on the trees. This George Washington statue is in the Public Gardens and he was also sporting a beard! 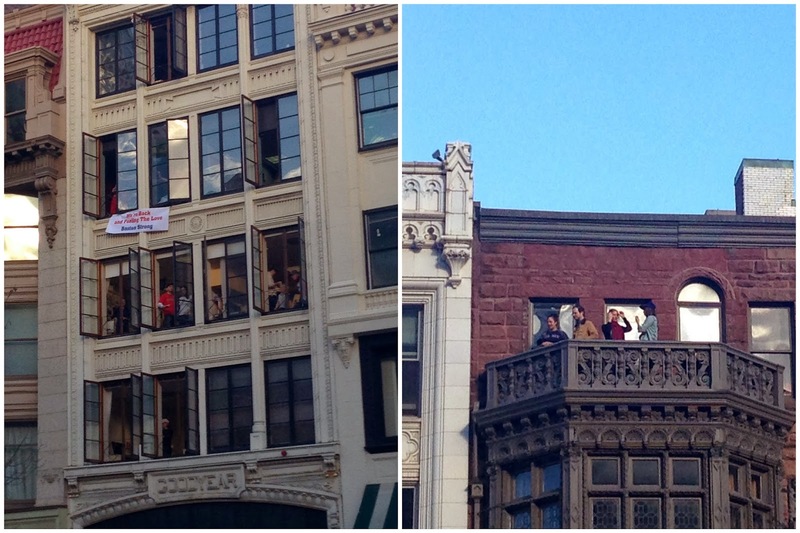 You got to love the Red Sox pride in this town. I bought a pennant (to put in one of the Fashion Plates baskets) but had to get a picture with it first. Come back tomorrow to see pictures of the duck boats in the river! I'm guest posting on the blog, Sophie's Talking Sports today so make sure you check that out too. Linking up for Monday Morning Gossip (late as usual). I wish I had gone in town...but friends backed out last minute. It looks like you had an AMAZING time! I'm bummed about that pretzel not being good, cause it looks delicious!!! Congrats to your Red Sox (even though I'm a Yankees fan)! 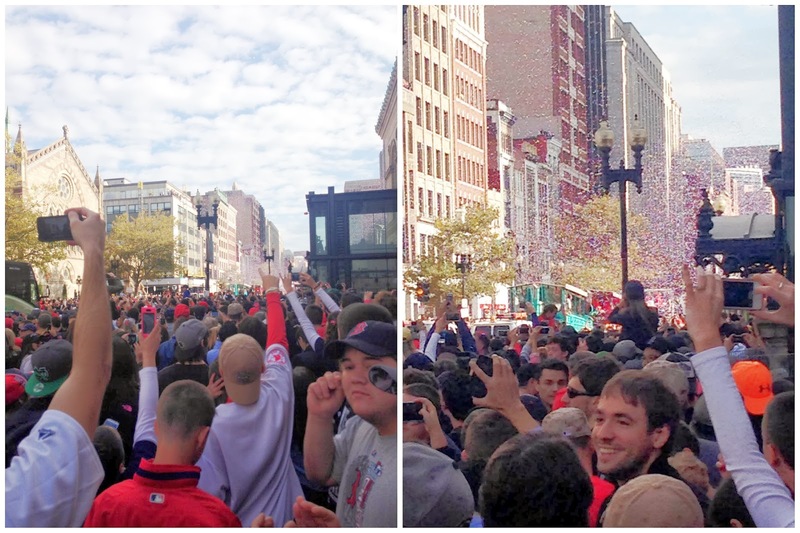 It was a great moment for Boston who definitely needed some happy times. Thanks for linking up (better late than never)! That looks like so much fun! I bet the vibe was just amazing. Let's Go To The Movies. . .